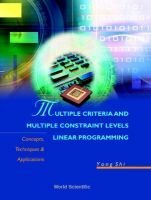 This book introduces multiple criteria and multiple constraint levels linear programming (MC2LP), which is an extension of linear programming (LP) and multiple criteria linear programming (MCLP). In the last decade, the author and a group of researchers from the USA, China, Korea, Germany, and Hungary have been working on the theory and applications of MC2LP problems. This volume integrates their main research results ranging from theoretical bases to broad areas of real world applications. The theoretical bases include the formulation of MC2LP; integer MC2LP and MC2 transportation model; fuzzy MC2LP and fuzzy duality of MC2LP; optimal system designs and contingency plans; MC2 decision support system; and MC2 computer software development. The application areas are accounting, management information systems, production planning, and telecommunications management.The book serves as a seminar text for both undergraduates and graduates who have a linear algebra or equivalent background. For practitioners, it will help in handling LP type problems in multiple decision making environment.